A stunning complement to a stylish person, this antiqued amethyst and diamond necklace fashioned from sterling silver and 14 Karat gold is simply stunning to behold. The necklace is an amazing connection of small and linked 925 sterling silver in a continuous flow with a pendant attached. A stylishly designed scalloped shape defines the pendant which is also fashioned from sterling silver with intricate designs all around its edges. The stunning 7.50 Carat green amethyst gemstone sits resplendently in the middle of the pendant, encircled by a gold accent fashioned from a thread of 18 Karat gold. 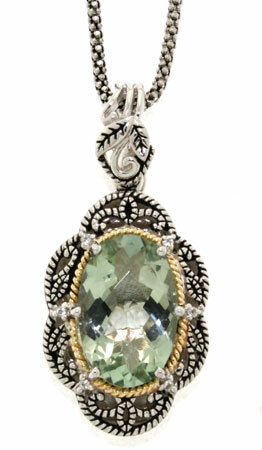 This is even enhanced with six, 0.06 Carat diamonds mounted on each of the prongs holding the green gemstone. We guarantee our Antiqued Green Amethyst and Diamond Sterling Silver Necklace with 18K Gold Accent to be high quality, authentic jewelry, as described above.